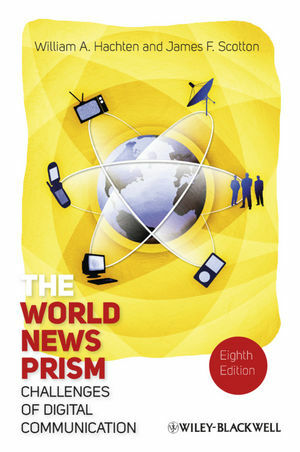 Fully revised and updated, the eighth edition of The World News Prism analyzes the changing role of transnational news media in the 21st-century globalized world and its impact on rapidly changing news events. William A. Hachten is Professor Emeritus of Journalism and Mass Communication, University of Wisconsin-Madison where he taught for 30 years. His publications include: The Troubles of Journalism, Third Edition (2005), The Growth of Media in the Third World (1993), and The Press and Apartheid (with C.A. Giffard, 1984). James F. Scotton is Associate Professor of Journalism at Marquette University, Milwaukee. He has taught in Lebanon, China, Egypt, Kenya, Nigeria, and Uganda, and has worked as a reporter, editorial writer, and editor with the Associated Press and newspapers in several states and in China. Together James Scotton and William Hachten are the authors of New Media for a New China (2010, Wiley-Blackwell).